See full Pearl Delta map (incl. 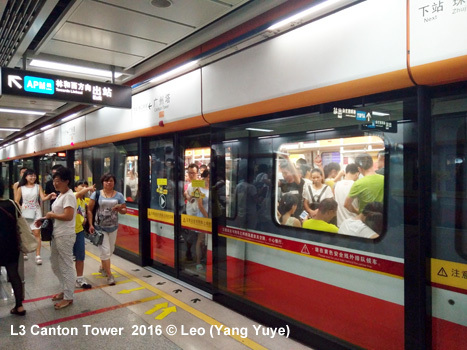 Foshan & Dongguan metros) here! 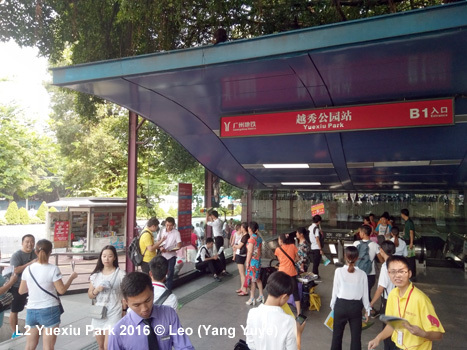 The Chinese city of Guangzhou (formerly known as Canton) is the capital of the Guangdong Province and has 7 million inhabitants. It is situated in the south of the country near Hong Kong. 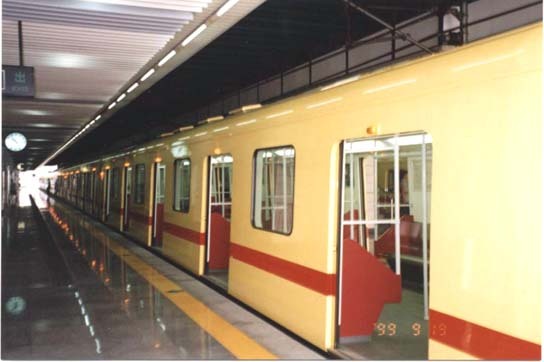 Construction of a subway network was approved in 1989 and construction started in 1993. 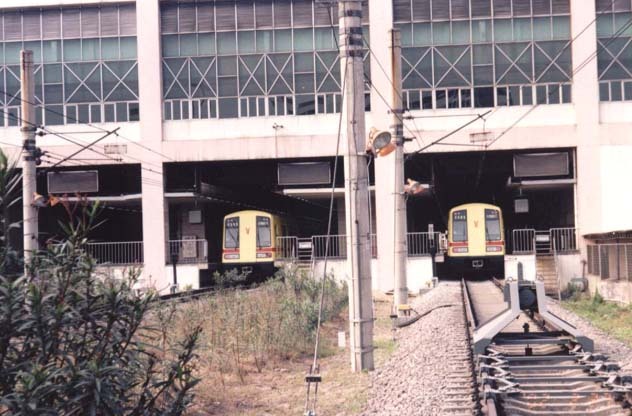 Line 1 was officially inaugurated on 28 June 1999. 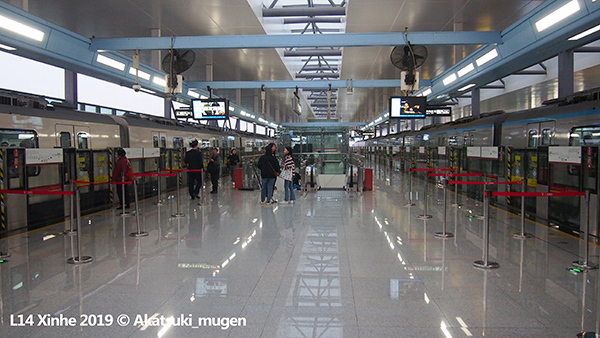 It was built as a turnkey project by a consortium led by Siemens. 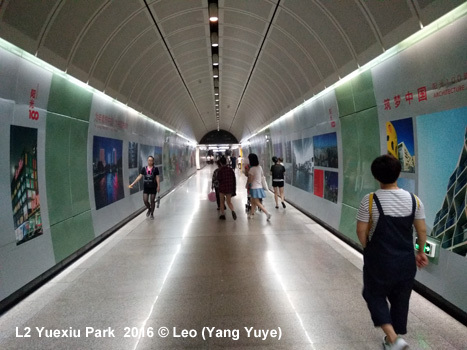 Apart from Keng Kou and Xi Lang all stations are underground. 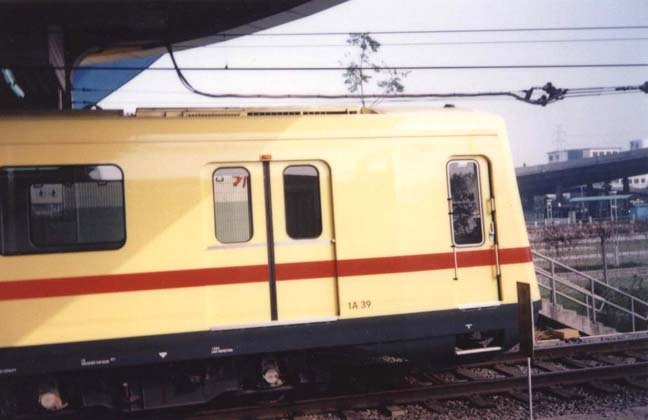 21 air-conditioned 6-car-trains were supplied by Adtranz. They operate in ATO-mode. 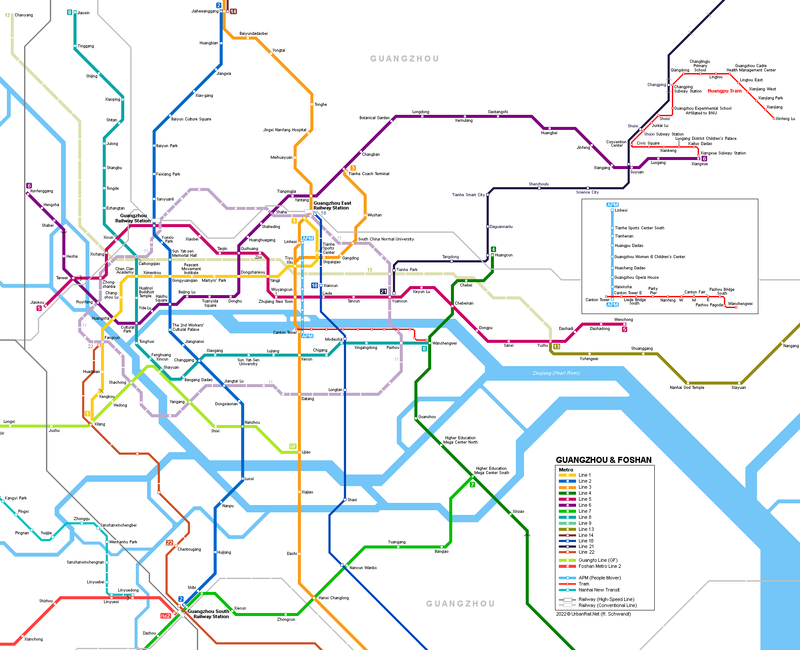 The metro runs at an average speed of 36 km/h. A trip along the entire route takes 32 minutes. 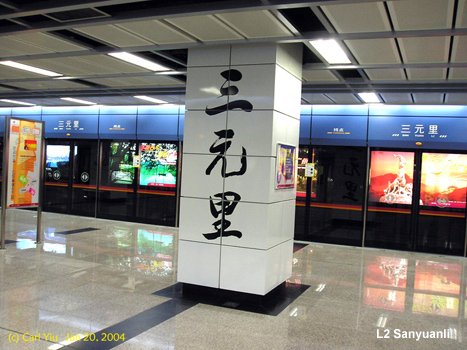 Service on the central section of Line 2 (23.3 km with 20 stations - 17 underground, 2 elevated and 1 at grade) started in Dec 2002, more than a year ahead of schedule. 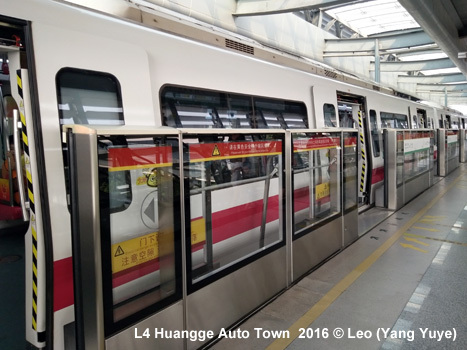 Trains were produced by a joint venture of Adtranz and Changchun Car Company. 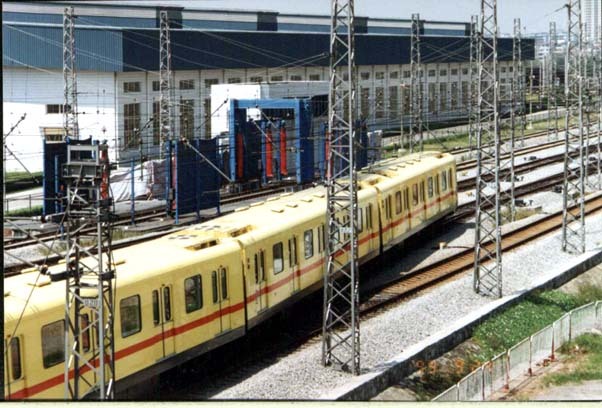 The 26 Adtranz Movia trains were built in Germany and in China. 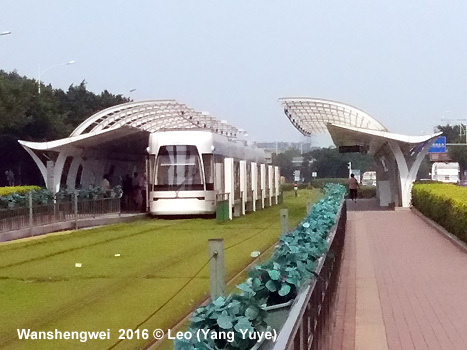 39.5 km, 25 stations - interurban metro line between Guangzhou and Foshan; Line 1 of Foshan's separate metro network. 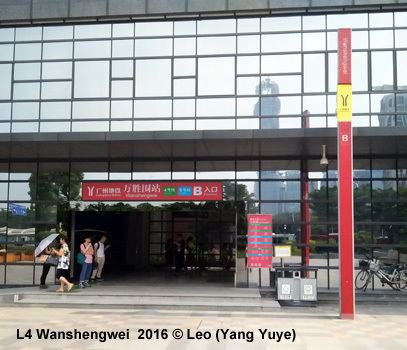 - List of stops: Canton Tower, Canton Tower East, Liede Bridge South, Party Pier (opened 21 Oct 2015), Nanfeng, Exhibition Center West, Exhibition Center Central, Exhibition Center East, Pazhou Bridge South, Pazhou Pagoda, Wanshengwei. 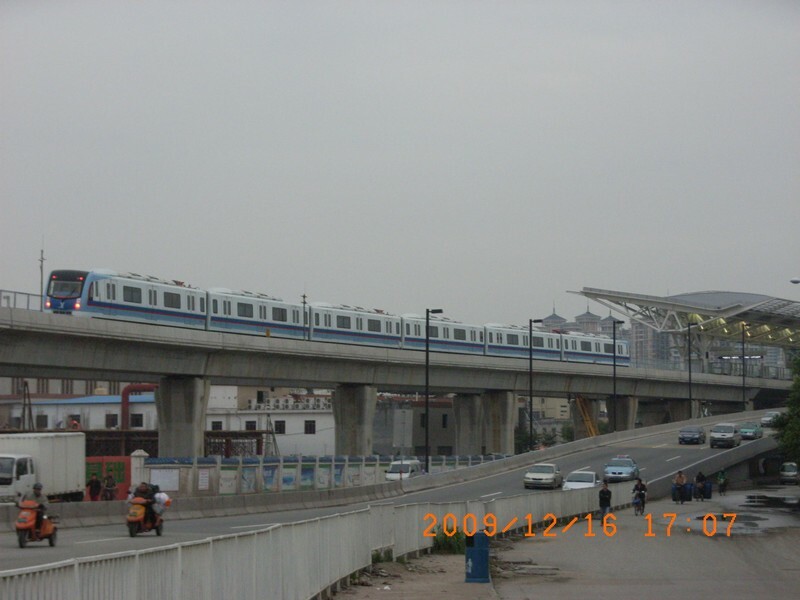 The largest city in southern China, Guangzhou was the fourth city in the People's Republic to operate a metro. 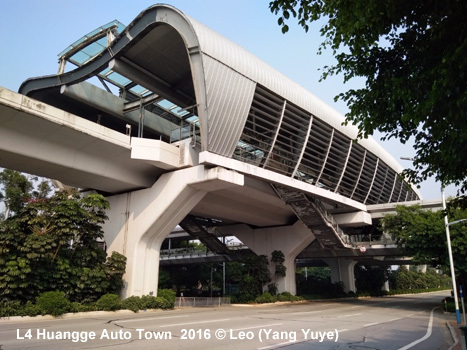 Now aged 20, the system has witnessed incremental expansion over this period and now has 9 lines and an Automated People Mover, covering 299.6km (+3.9km People Mover) (266.7km underground) - the world’s 8th longest and 4th busiest metro. 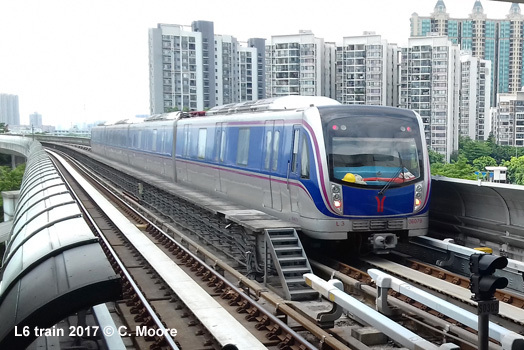 Additionally, the city and its Metro form the northernmost part of the Pearl River Delta Region Intercity Rapid Transit system which includes Dongguan, Shenzhen and Hong Kong. 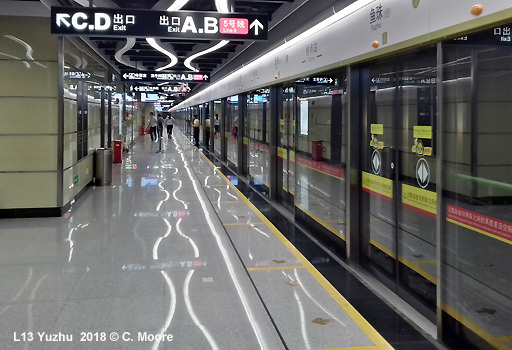 Although not yet fully interconnected, the 150km between Guangzhou and Hong Kong is home to 5 metro systems, 29 lines, 850km of route (624km underground) and 434 stations – quite something! 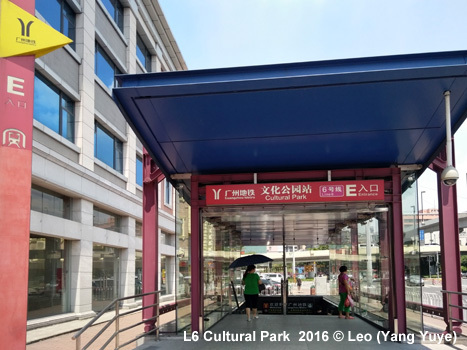 Line 1 is 18.5 km (16.6km underground) and runs through the traditional centre of the city. 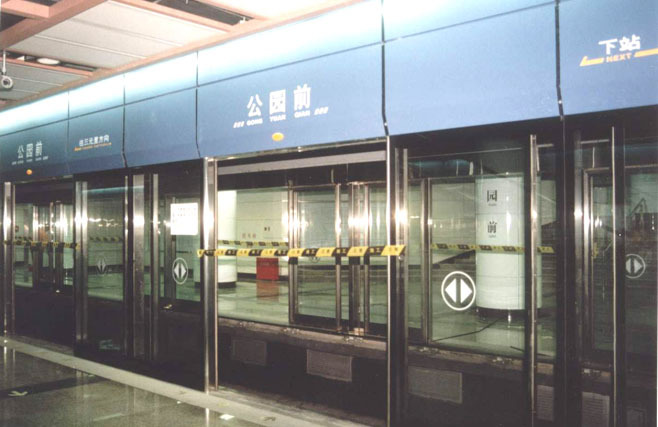 Its stations are of the basic Chinese model and the transfer stations (especially Tiyu Xilu) have huge entrance areas with multiple barriered pathways to cope with high passenger levels. 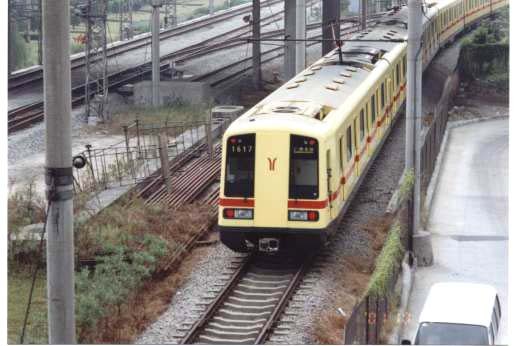 Some of the original pale mustard Siemens stock is still used and it is worth stopping at the grade-level stations (Kengkou or Xilang) to see them at work. 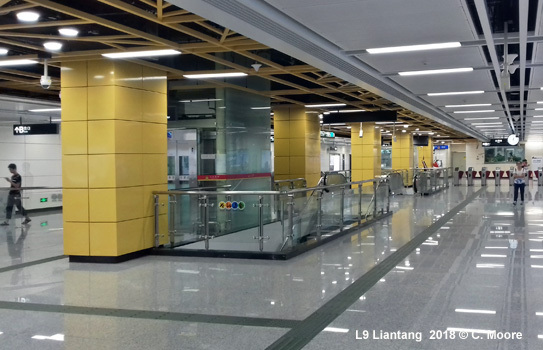 Xilang is a large, multi-platform structure with dated furnishings, signage and ticket hall, offering a long transfer to the Guangfo Line – and here the juxtaposition of the two styles/eras is interesting. 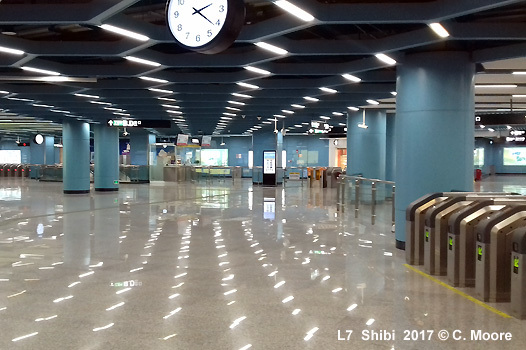 Line 2 is the westerly of the two north-south Metro lines and has a more modern feel with bold glazed tiling in stations and platforms. 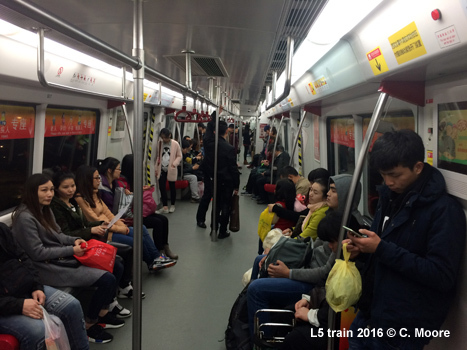 Similar to Line 1, this is a busy line and connects to 5 (soon 6) other lines. 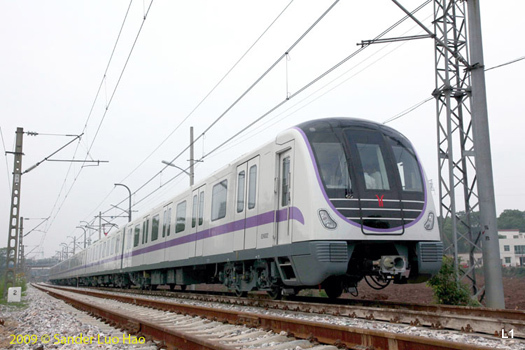 It uses smart white Bombardier stock and is fully underground at 31.4km. 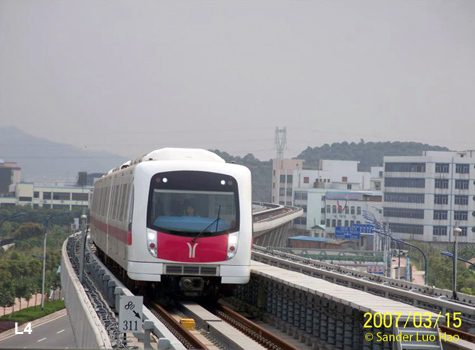 At its northernmost, Line 2 has a hectic interchange with the northern branch of Line 3 at Jaihewanggang, where it forms a parallel north-south line in the east of the city. 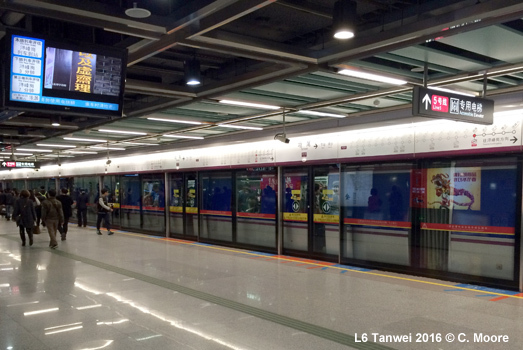 On Line 3, the main line runs from Tianhe Coach Terminal to Panyu Square in the far south (33.1km) and at Tiyu Xilu the single line platforms allow for cross-platform interchange to the 32.3km ‘branch’ heading north to the airport. 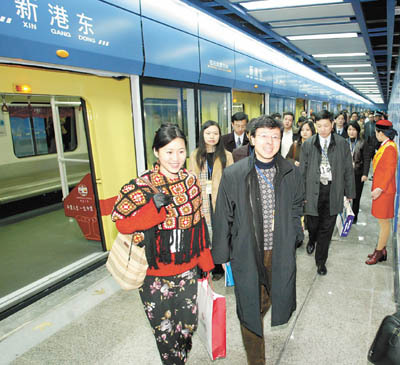 This is a fully underground line (the longest fully underground line in the world) and the busiest on the system. 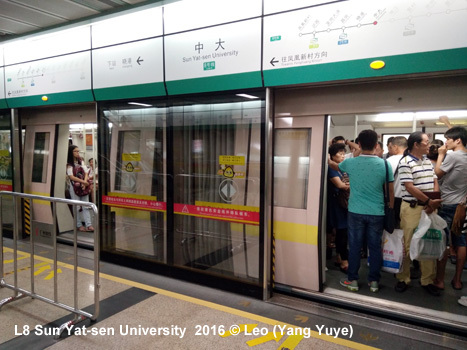 It is massively overcrowded (Tiyu Xilu to Kecun especially), even with 3min base headways and the line to/from the airport takes an age, especially with the crush at Tiyu Xilu to change trains. 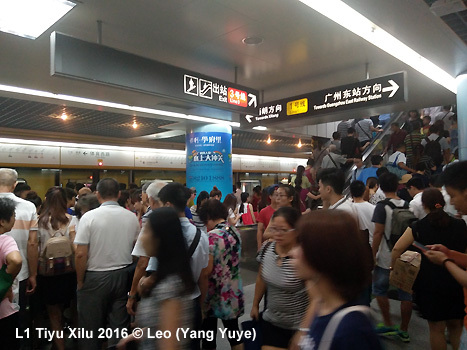 The Airport station is located at the end of the older main terminal (Guangzhou is a massive airport) and although well signed, and with a huge ticket hall, it is chaotic at peak times with people trying to comprehend the system. 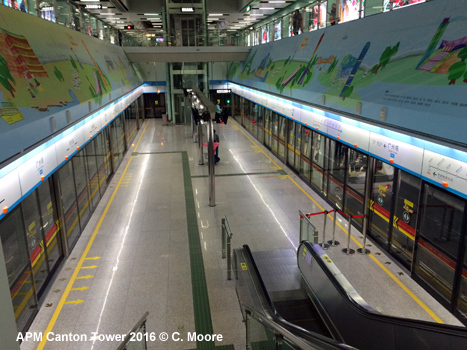 If Line 3 from the airport is your first experience of the Metro, don’t let it tarnish your views – it gets better! 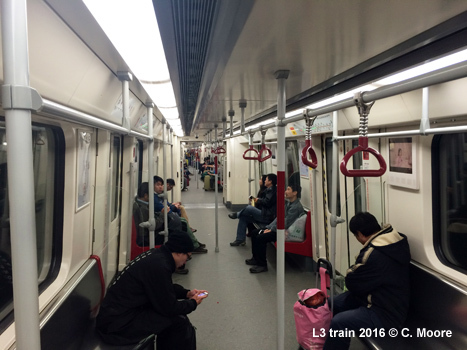 Line 4 is a good example of improvement. 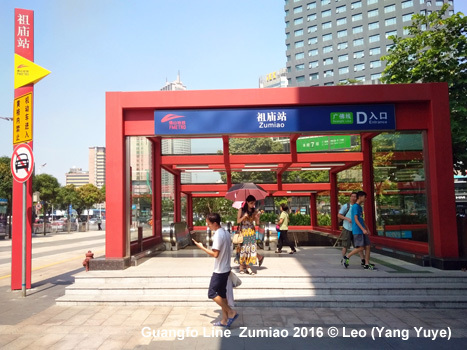 The 46.4km line heads a long way southeast through less dense areas of the city toward the Zhujiang estuary. 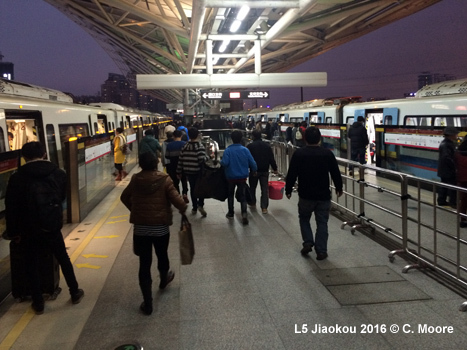 Only one third of the line (16.5km) is underground and the elevated line beyond Xinzao has significant station gaps with good line speeds as you view a much more rural/agricultural outlook - a lovely journey and a pleasant change from the turmoil and crush of the city centre operations. 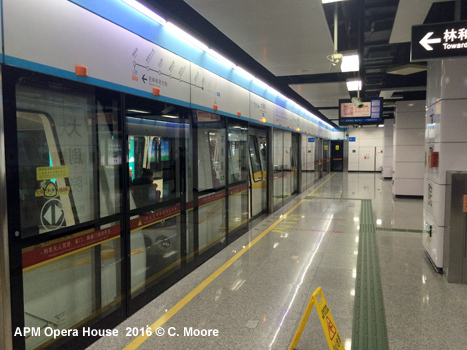 Line 5 runs east-west and is one of the nicer lines with modern, functional stations, glazed tiling, and smart stock. 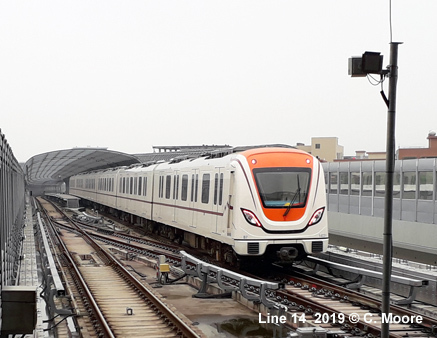 It has 31.7km of revenue track which is underground except the last 2.1km in the east, housing Tanwei (for transfer to Line 6 underground station) and Jiaokou stations, a rapidly developing area of the city. 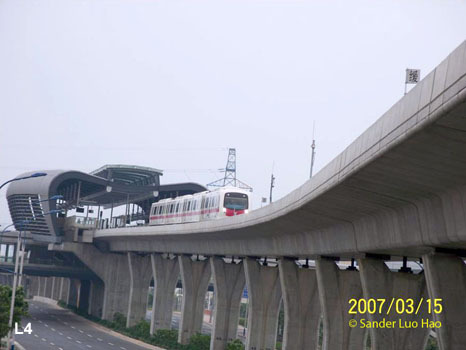 In this part of the city the bowl-shaped Line 6 has a 2.9km elevated section around Hengsha (side platforms/half screens) before turning east through the city and then north east to Xiangxue. 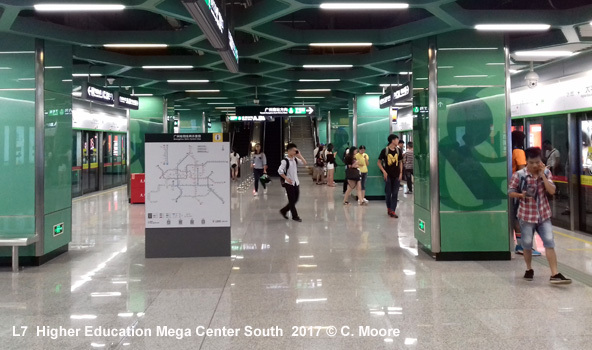 The 41.4km line is one of the newer additions to the system (especially east of Chanban) and the underground stations are very smart with a pale green hue, mainly island platforms and full screens. 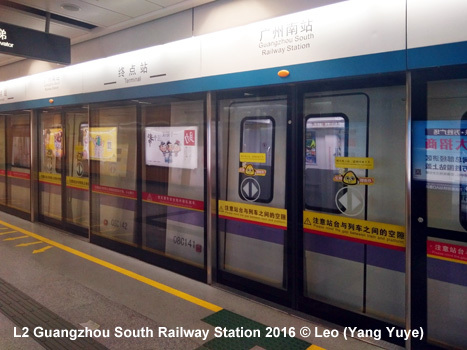 Patronage levels are manageable at the moment and 4-car stock operates, although stations are built for the standard 6-car sets. 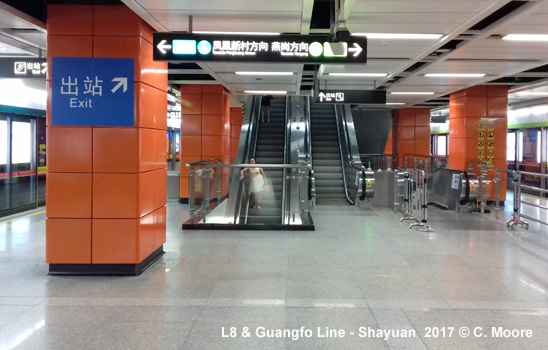 Line 7 is fully underground (17.4km), duplicating Line 2 in the southwest to Shibi (a different experience between old and new lines at this point). 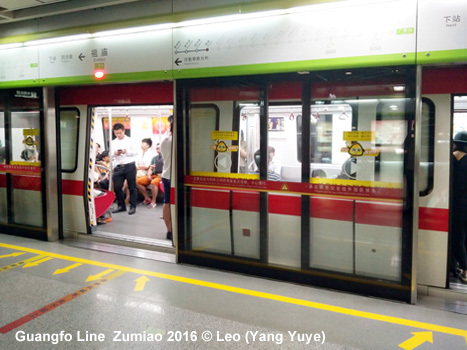 The line then runs east as a tangential line to HEMC South (transfer to Line 4). 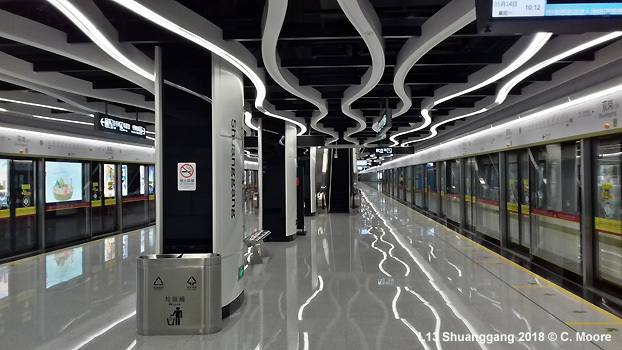 Although following the standard design outline for stations and platforms, this latest opening on the Guangzhou network is more bold with stylized colour schemes, pillars, ceilings and entrance porticos. 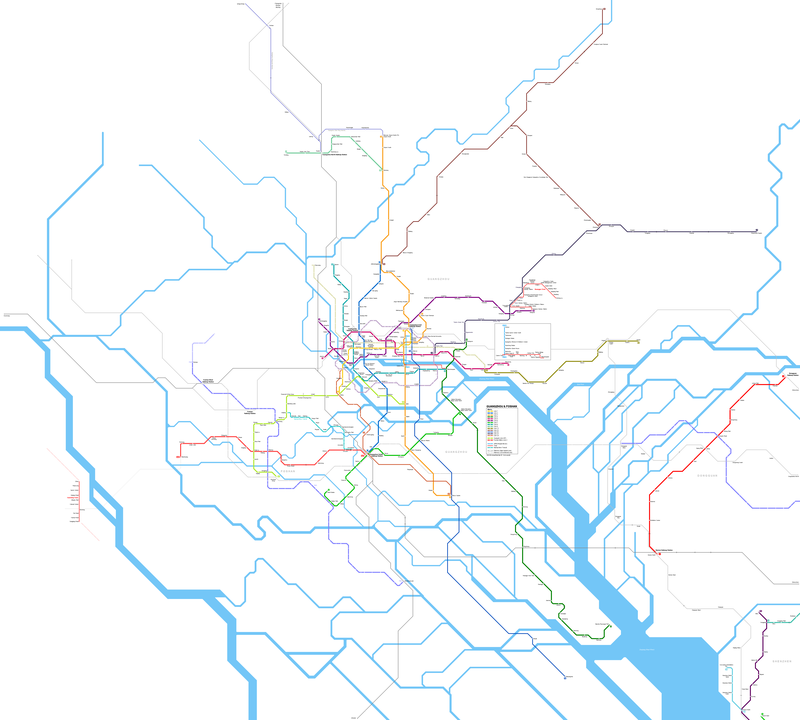 The line has the lowest headways on the Metro (7mins!) but is a lovely smooth and quiet ride. 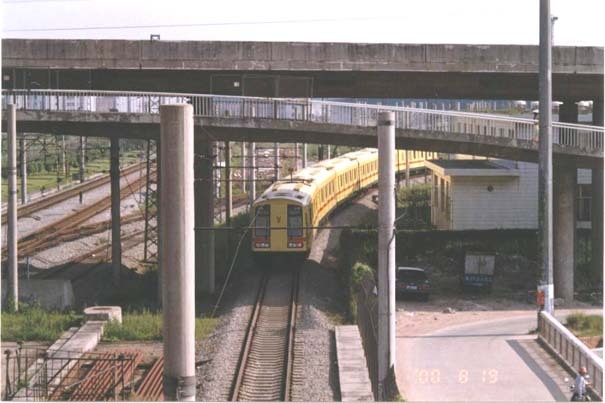 Line 8 runs south of the Pearl River in Haizu, parallel to Line 5. 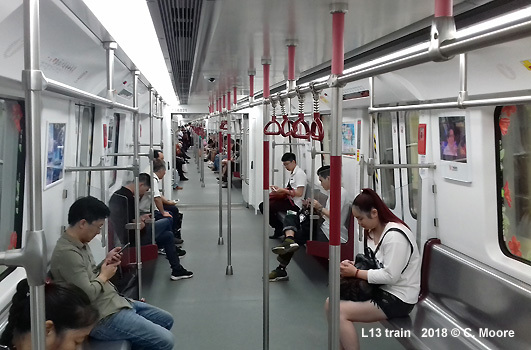 At 14.6km, this fully underground line is the shortest on the system, although it has much strategic importance, connecting with Line 4, the THZ1 tram at Wanshengwei, and the two main north-south lines (Lines 2/3) at very busy interchanges. 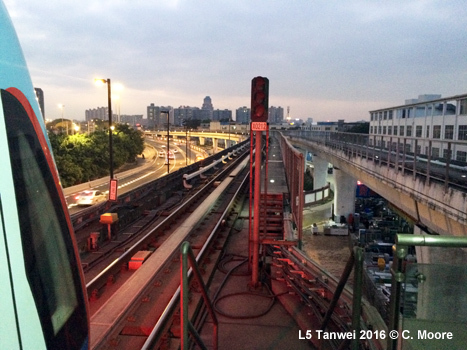 In the west there is cross-platform transfer to the Guangfo Line at Shayuan. This line helps to illustrate the incremental improvements in the system over the years, being built 8-9 years ago. 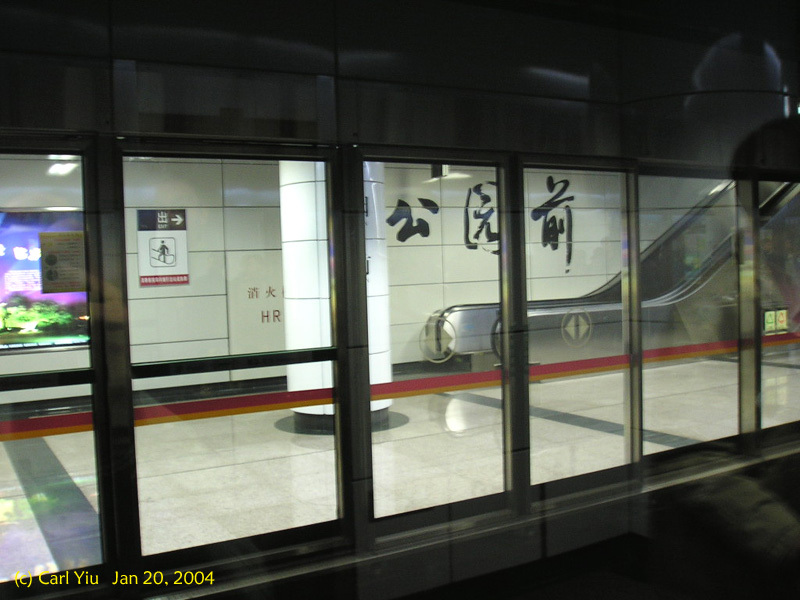 Its stations follow the template model but have more distinction than the earlier lines with bold colour and calligraphy. 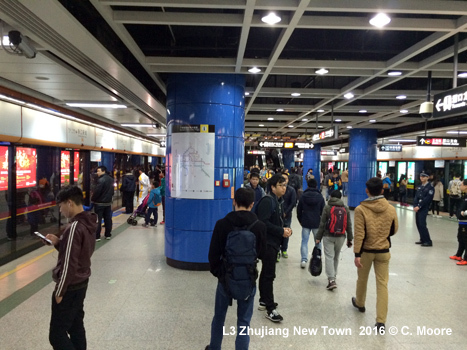 They are, however, a long way from the more muted, cool and fresh stations on the recent extensions to the system. 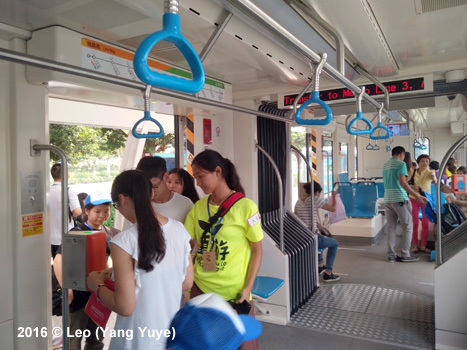 The 32.8km Guangfo Line (GF) Line, is also fully underground. This line is different in many ways from the other 8 lines. 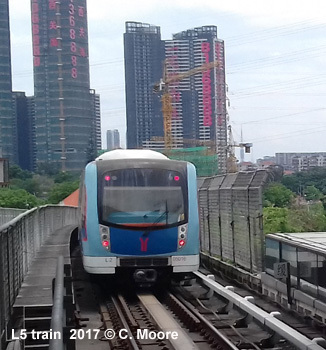 Heading west under the Zhujiang to Longxi (last station in Guangzhou) the line then runs under the Foshan Channel and through Foshan. 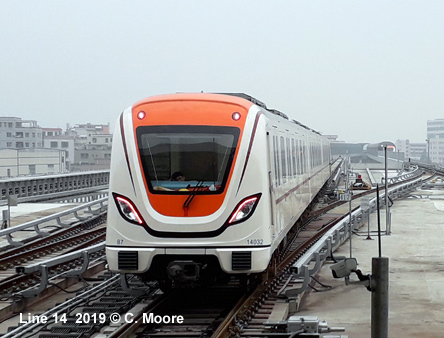 Foshan is a separate city from Guangzhou and, like Incheon, Taoyuan etc., the line can be considered ‘inter-urban’ with different ownership and operation from its bigger sister. 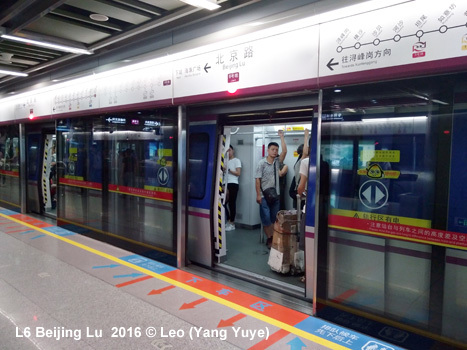 Although it is fully integrated with the Guangzhou Metro, it is established on all system maps as just another Guangzhou line, and has joint ticketing and barrier-free interchange, there are several differences to note. 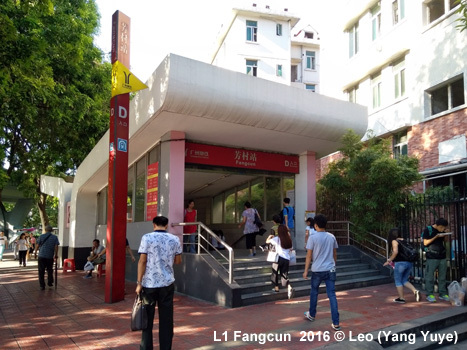 Staff have different uniforms, there is a different logo (in fact 2 different logos – GGIC and FMetro), ticket machines are different, there is a different feel and colour schemes to stations and CNR stock is used. 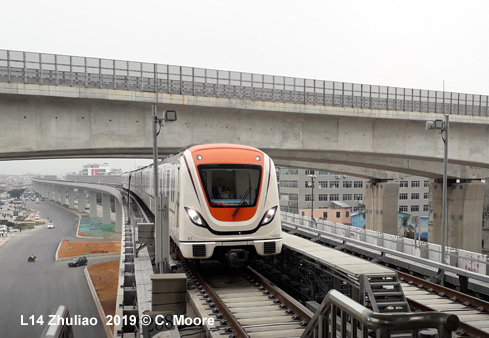 The line is operated by Guangdong Guangfo Inter-City (GGIC), a company co-owned by Guangzhou Metro (51%) and Foshan Metro (49%) with the 19km section (15 stations) operating within Foshan boundaries (Xingcheng East to FHT Zone) also branded as Line 1 of FMetro (Foshan Metro). 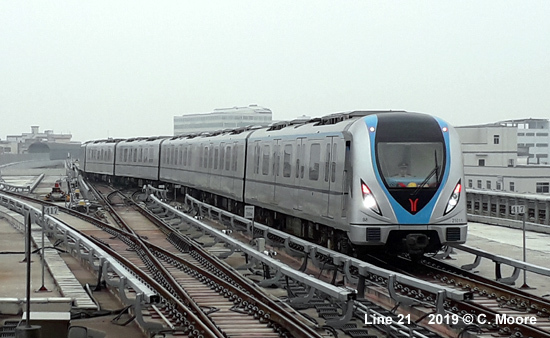 Once more lines of the FMetro are completed, then this line will have more clarity in its identity. 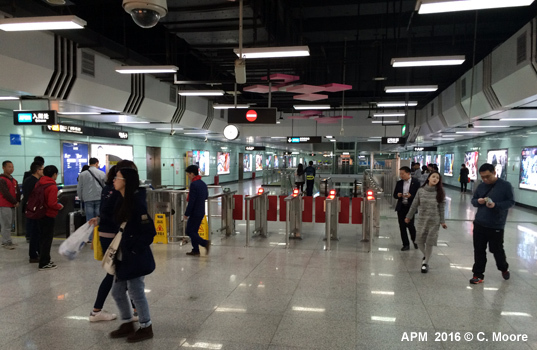 GMC also runs the Zhujiang New Town APM. 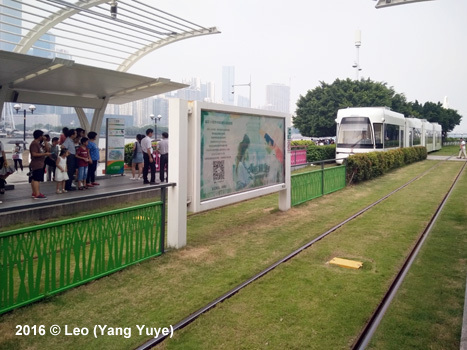 This is a 3.9km automated line with 9 stations running from south of the river at Canton Tower (5min walk to Tram), through the new CBD and north to Linhexi. 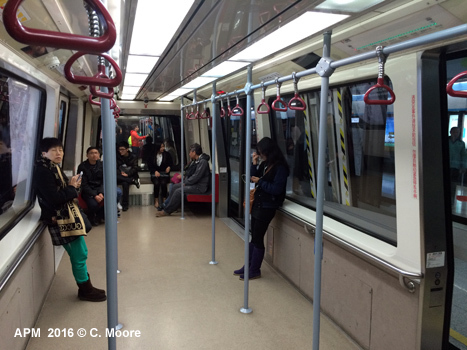 Using 2-car Bombardier APM100 stock, the line runs 6min headways. 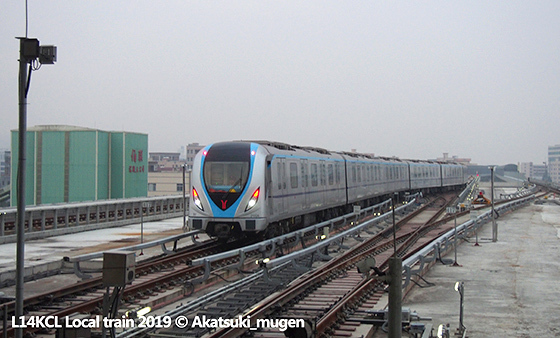 Although it shares stations with the Metro Line 3 stations, long transfer is required and new tickets are also required as you have to exit and re-enter the alternate systems. 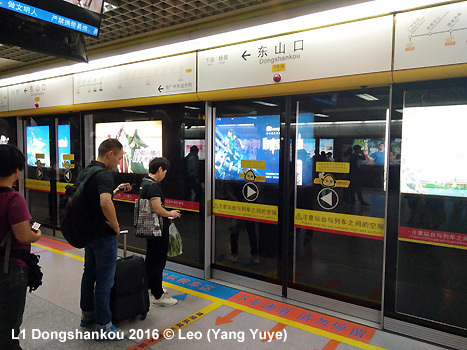 The stations are small but impressive with full screens, although it does appear to not be well used at the moment. 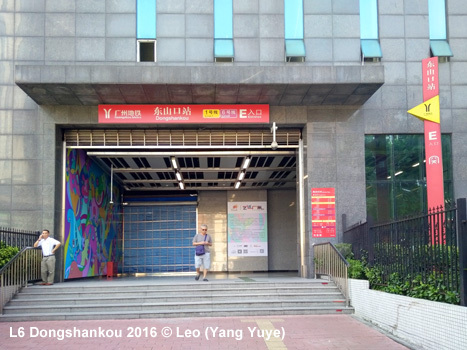 Station entrances are identified by tall, slim totems and entrance halls have security, ticket machines and information/ticket offices. 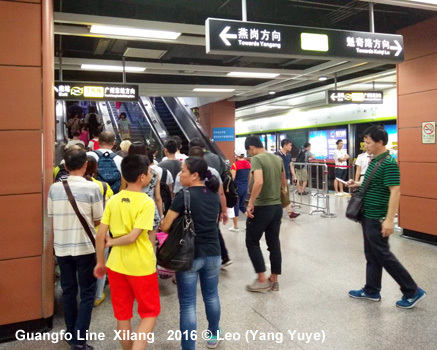 Staffing seems to be at a lower level than other systems in China and some Information/ticket adjustment offices are not staffed. But all stations have dispensers offering hard-copy schematic maps (2 leaf folded). The size of the system and the smallness of the leaflet means small font is required and it is almost impossible to read (age possibly!). 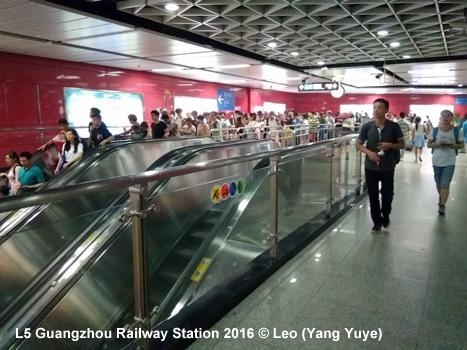 Maybe I was unfortunate, but many escalators were not operating and access between levels tended to involve stairs. 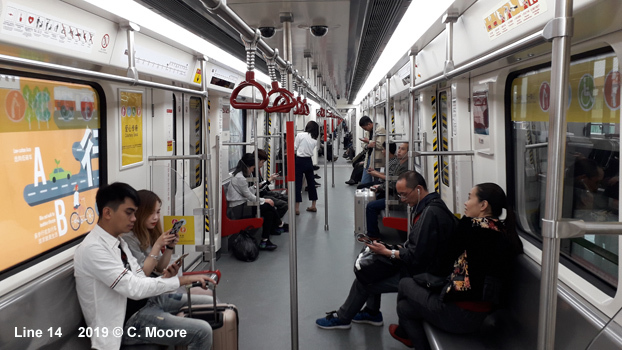 Platform areas are of standard fare with mainly island platforms underground (full screens) and a good mix of side and island on elevated sections of the system (half/three-quarter screens). 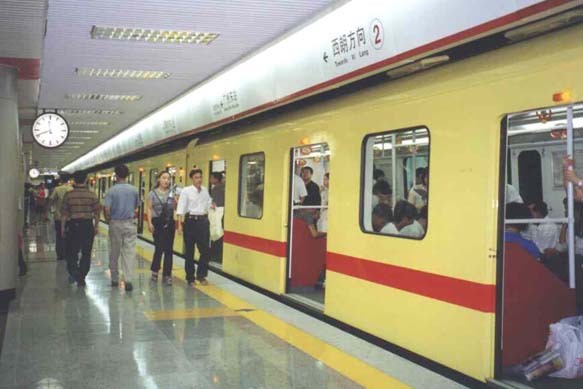 Whilst the newer lines do offer bolder colours and more design features, in the main the offer is representative of the basic Chinese design model. 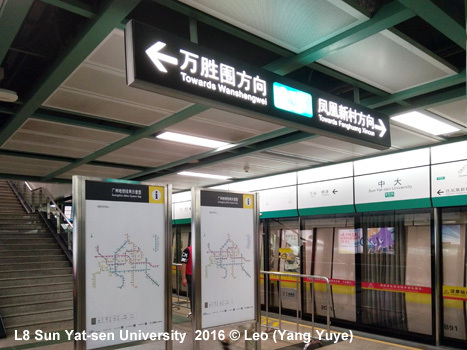 On maps and trains, stations are identified by Line number and station number (e.g. 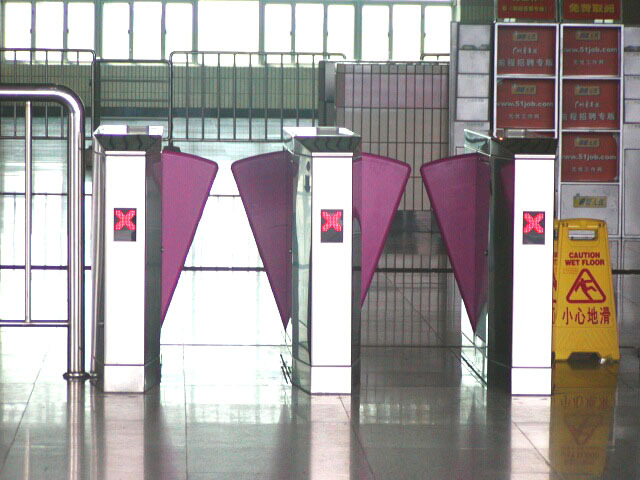 1-14). 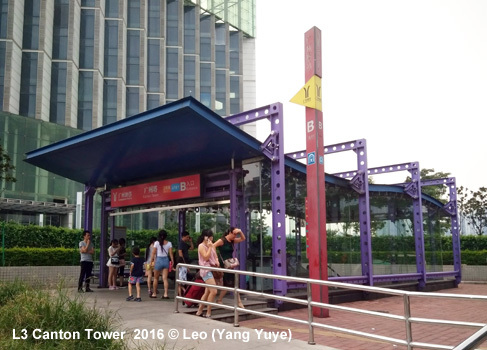 Services operate from 0600 to 2330 and headways are excellent with the norm being 4-5mins (Line 3 has 3min headways and Line 7 has 7mins headways). 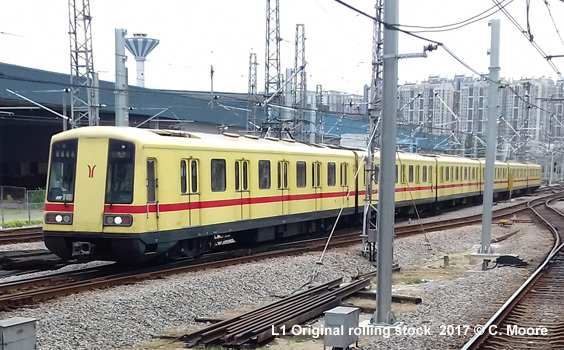 Trains are pretty basic and are mainly of CSR 6-car sets, with only Line 4, 6 (Light Metro type) and GF using 4-car stock at present. 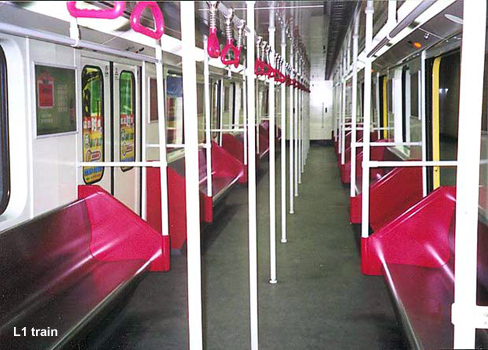 The stock has a colour-coded band on the outside and the interior is kept very clean with side seating and standing room for this very busy system. 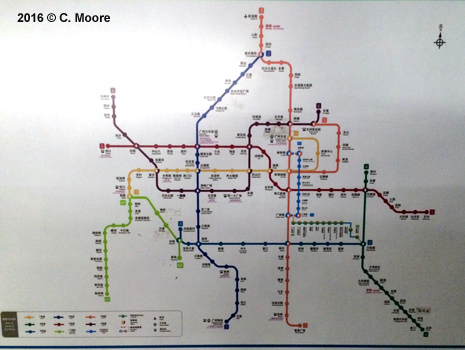 Strip maps are located above the door and a small network schematic is also available although, as mentioned, the font size is so small it is of limited use, even close up. 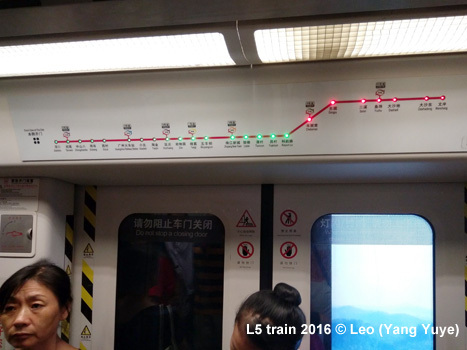 Power supply is also mixed with overhead the norm (Lines 4, 5 and 6 utilise third rail). 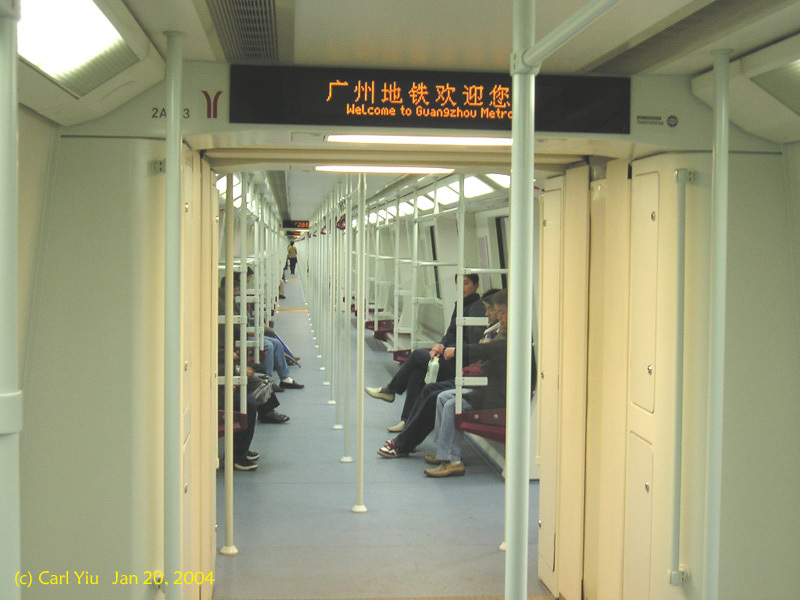 Audio and electronic information is in Mandarin/Cantonese and English. 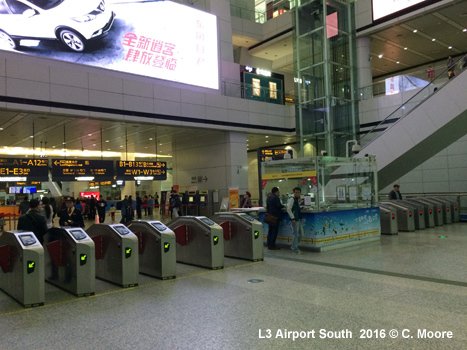 Fares are distance based (2-14 Yuan) and tickets are in the form of RFID cards. 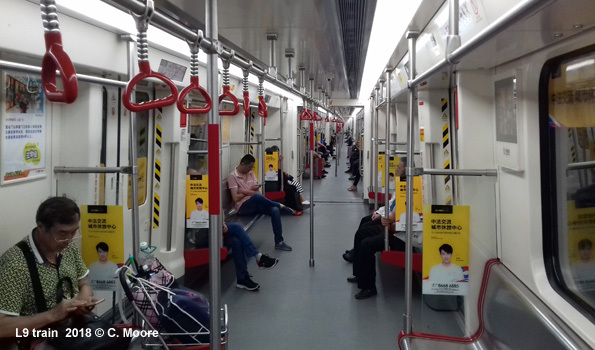 Being close to Hong Kong and being open to its influence for longer than other parts of China, GMC were the first Mainland Chinese operator to permanently offer day tickets - a 24-hour pass is available and is wonderful value at 20RMB (a 72-hour pass also available). Overall, this is a system that frustrates and excites in equal measure. Its scale and buzz are impressive. 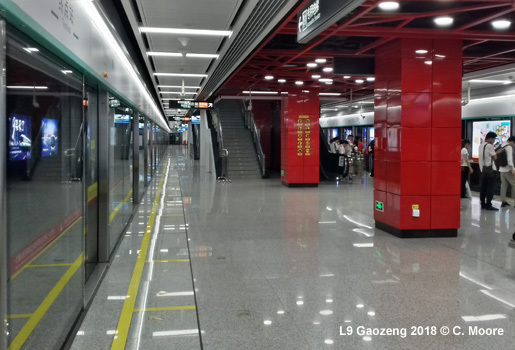 It has very good coverage and headways, and some interesting features of note - providing good examples of the iterative changes that have occurred in Chinese metro development and design since the mid-2000s. 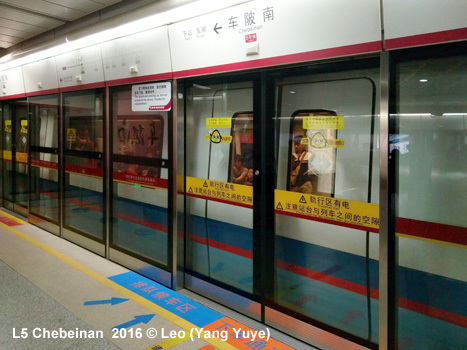 The Guangzhou Metro, though, does appear less ‘disciplined’ than other systems in China. Perhaps this is the volume of passengers, the fact that many of the stations were built in a period of basic design, the trains shorter and space more in demand, or the more ‘easy going’ nature of the south? 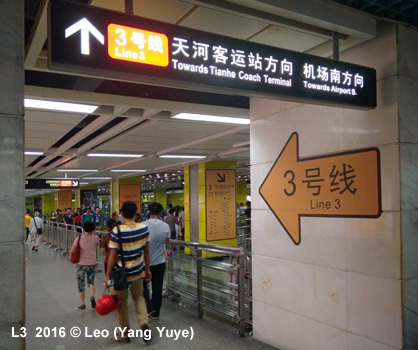 Regardless, the system does have some flaws, mainly in wayfinding (which does not appear to have the high standards of clarity that is the norm in China), the limited number of wall schematics at ticket hall level and the size of print on maps which make it almost impossible to read (even close up). 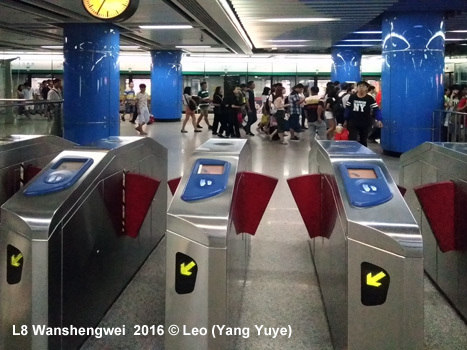 The system is also showing its age and high usage levels with some inoperative bits in stations making transfer, access or exit all the longer. 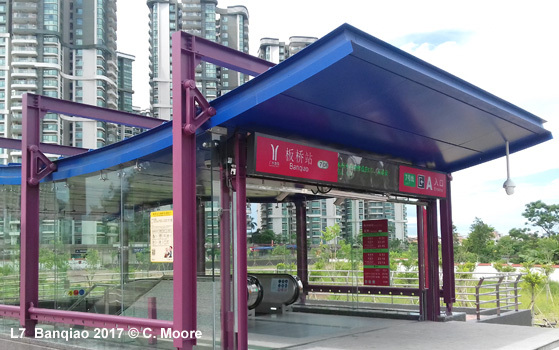 When coupled with the heat and humidity, the experience of using the system can be draining (this is particularly the case at the main interchange stations). 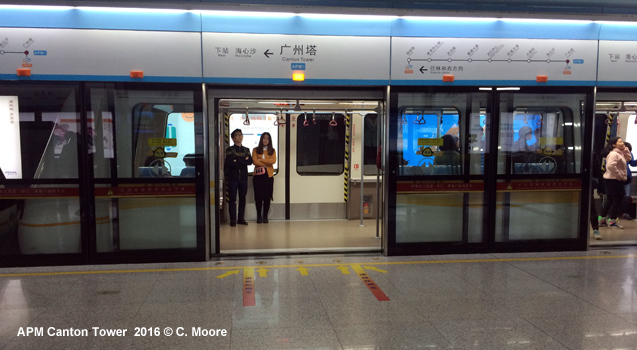 It certainly has a different feel, but once familiar with it, the Guangzhou Metro grows on you.